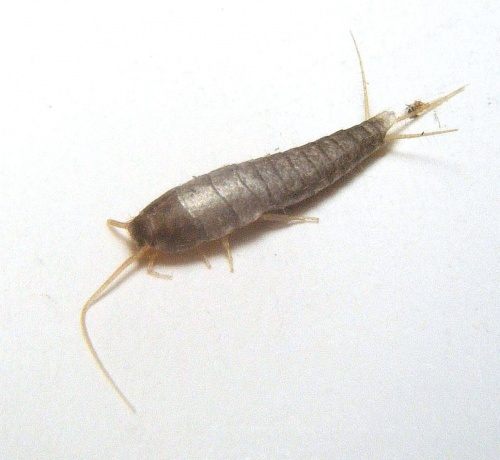 This is an elongate, and flattened insect typically 12 to 25 mm in length and wingless. It gets its common name from its silvery light grey and blue colour, combined with the fish-like appearance of its movements. The three bristles at the tip of the abdomen are called cerci. Often found in basements, bathrooms, garages, closets and attics, but requiring a relative humidity of between 75% and 95%. Nocturnal feeding on carbohydrates and sugars. The things they consume include glue, book bindings, paper, photos, sugar, coffee, hair, carpet, clothing and dandruff. They can live for a year without eating.